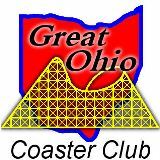 The Great Ohio Coaster Club is a social club created for the simple enjoyment of the roller coaster, wood or steel. We hold a variety of events (typically 3 - 4 per year) in various locations including Ohio, Pennsylvania, Indiana, West Virginia, New York or Canada, along with an annual Holiday Party. Our club is also preparing for its first coaster trip to Great Britain. The club is governed by an elected set of Board Members, assisted by appointed Officials. Since its humble beginning in 1992, the club has grown to over 1600 members in 26 states, the District of Columbia and Canada.